Below is a list of questions we get asked the most often, and the answers to those questions. 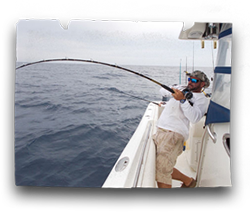 We hope you find this information useful in the planning of your fishing adventure with us. Please feel free to contact us at any time with additional questions you may have. 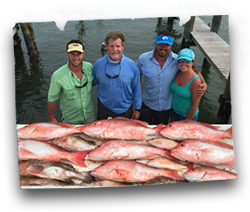 We look forward to seeing you on board with the Offshore Hustler Fishing Team! Q. Will we catch fish? Q. Do we supply live bait? A. Only if needed. 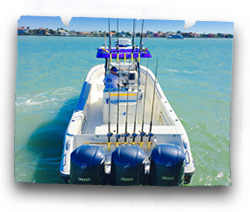 Depending on the trip, time of the year and what we are fishing for, we will stop on the ride out and catch fresh live bait for your trip to be successful. We supply you with frozen bait for all of our trips. Q. What’s included in the price of a charter? A. Your fare includes rods and reels, bait, tackle, ice, fish cleaning and fish packaging. Q. Do I need a fishing license to fish on your boat? A. No. All passengers are covered under our recreational charter boat license. Q. What do I need to bring for my trip? warmer clothes in the winter months. 2. Any food and soft drinks you would like for the duration of the trip. 3. White-soled sneakers or deck shoes. No black-soled shoes please. get on board. All local pharmacies carry them, as well as patches for more advanced cases. Q. What should I leave behind? A. Please do not bring the following aboard. Your cooperation is greatly appreciated. Q. Can I bring alcoholic beverages aboard? A. You are welcome to bring beer and consume in moderation. No hard liquor of any type is permitted. Q. Can I bring my own rods/reels and tackle? A. You can if you wish (2 per person max. ), however, it is not necessary as we provide them for you on board. Q. Can I bring a cooler on board? A. Our on-board coolers are available for your personal use. We ask that you plan on using them to prevent clutter on deck. We do suggest you bring a cooler in your vehicle to carry your fillets home in. We will gladly ice your cooler for you. Q. What time do we leave? A. Departure times are flexible based on the type of trip you are booking. Your captain or mate will assist you in deciding your departure time and location while you are planning your trip. We normally leave the dock at 7:00 am for most trips unless you are scheduled for an afternoon trip. Q. How do I book a trip with you? A. Once you have decided on a date(s) and type of trip you'd like, call us at: 727-647-3783 or 813-841-8749; or fill out our Charter Request Form on the rates/booking page on our web site. We are always available to help you with your decision. A $100.00 deposit is required at the time of booking, to hold your date/trip. A. We prefer cash or money order. We are unable to accept personal checks. If you wish to pay by credit card, you are welcomed to do so by visiting www.paypal.com. Creating an account is quick and easy. Once you have done so, simply choose the “send money” option. Our verified PayPal account name is captainpete@offshorehustler.com. PayPal is the most secure and reputable online credit card payment source there is. Please note that trip must be paid in full prior to departure. If balance is due on the day of your trip, please pay your captain in cash when you arrive at the dock. NO credit cards at the dock. A. To receive a full refund of your deposit, we ask that you give us no less than 7 days notice prior to your scheduled departure time. If you choose to reschedule the date of your trip within the 7 day period, your existing deposit will be kept as a rescheduling fee, and you must make a new deposit for the rescheduled date. If choose to cancel your trip within the 7 day period, 50% of your trips cost will be due. Trips cancelled by us at any time prior to departure, due to weather, mechanical, or other unforeseen circumstances will be refunded within 3 days of cancellation. At Offshore Hustler, your safety is our primary concern. The captain alone decides if the weather and sea conditions are suitable and safe for fishing. Any cancellation due to weather conditions is at the sole discretion of the captain. Q. Can we keep what we catch? A. Yes you can, however, you must stay within legal size and bag limits on all species of which such limits apply. Q. What can I do with my fish if I am visiting from out of town or just don’t feel like cooking them? Q. How do I get a fish I caught mounted? A. We use one of the finest taxidermists in the area, and would be glad to assist you in having your trophy catch mounted and shipped to your location.